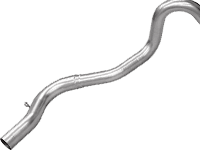 100% Stainless Steel muffler resists rust-out three times longer than competitors' premium aluminized mufflers. Direct-fit and universal mufflers provide a quality repair alternative, at a competitive price. ​100% aluminized steel construction affords Walker Tru-Fit mufflers corrosion resistance, for durability and longer service life. ​Spot-welded bushings are featured on Walker Pro-Fit mufflers for greater stability and support, proving durability and long service life. ​The proven turbo-flow design allows Walker Installer Turbo mufflers greater installation flexibility, as they are reversible. The Right Loading of Precious Metals. Fits Like OE, Because We Make OE. An Industry Leader for Import and Domestic Applications. Walker® premium pipe is manufactured with precision benders, and then fixture checked, insuring every part is a perfect fit. Our premium pipe is designed with OEM type connections, to ensure leak free seals, and we utilize OEM routing and hanger positions to provide the perfect fit, for easy hassle-free installation. Walker® utilizes a state-of-the-art tube cutting manufacturing process, to produce burr-free tubing, that is easy to install. 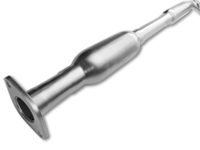 Modifications to the exhaust system including fabrication or welding may be required to install these universal parts. Walker air gap pipe, is double walled pipe with an "air gap" between layers of pipe to promote insulation and allow faster converter light-off, for reduced emissions. Walker incorporates air gap pipe into designs where the OE uses that technology (or a full 360° heat shield), and also where the front pipe is integral part of the converter assembly. Using air gap pipe also assures that there are no jagged edges and no possibility of the heat shield weld coming loose to cause noise. Clamps, Gaskets, Hangers, Spouts, and Universal Mufflers, Adapters, Connectors, and Insulators are also available.